The NFL preseason is in full swing, giving us quick glimpses of who’s hot and who’s not. While we won’t see any meaningful snaps for a few more weeks, it’s a good time to assess where things stand around the league. Here are our predictions for who will hear their names called at this season’s NFL Honors. Garrett was taken No. 1 overall for a reason. He’s a transcendent talent with the potential to become the next Joey Bosa, Jadeveon Clowney or Khalil Mack. The edge rusher racked up 31 sacks and seven forced fumbles in three seasons at Texas A&M. His combination of size (6’4″, 272 pounds), strength (33 reps benching 225 pounds) and speed (4.64 40-yard dash) is harder to find than a pair of eclipse glasses. Offensive coordinators will likely try to scheme ways to slow him down. However, Garrett will join an up-and-coming front seven that features enough pieces to draw some of the attention away from him. 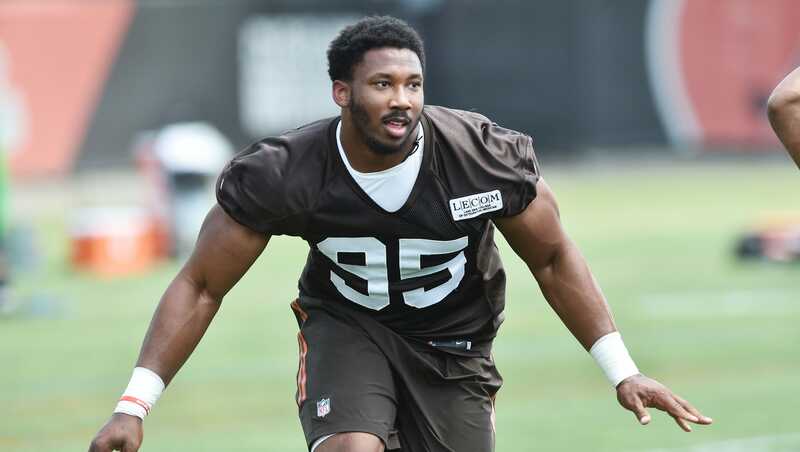 Cleveland defensive coordinator Gregg Williams has raved about the rookie all camp long, and Garrett already registered his first sack as a professional in the Browns’ first preseason game against the New Orleans Saints. With no quarterback expected to play a full 16-game slate this year, Garrett could easily become the first defensive player to win the outright Rookie of the Year award since Ndamukong Suh in 2010. Cook is the total package, with the ability to run, catch and protect the quarterback. He looked sharp in his first preseason game and already has the front office buzzing about his potential. Latavius Murray, Cook’s biggest competition for touches, started training camp on the Physically Unable to Perform list. If the offensive line holds up, Cook could be in for a huge year. The Bills drafted White to make up for the loss of Stephon Gilmore in free agency, but his performance at camp thus far gave the team enough confidence to move on from Ronald Darby, Buffalo’s top corner last year. LSU defensive backs typically translate well in the NFL, and if White lives up to expectations, he’ll deserve this type of recognition. Lynch spent last year on the outside looking in, staying out of the spotlight for once in retirement. He watched from afar as Oakland cruised its way to an impressive 12-4 record, the team’s best since 2000. He watched as Derek Carr, Amari Cooper and Khalil Mack became some of the budding stars in the league. He also watched as the Raiders struggled to find a consistent running back. While Oakland took a major step forward as a team, Latavius Murray had a difficult time getting much going in the ground game. He carried the ball 195 times for just 788 yards, but finished fifth in the league with 12 rushing touchdowns. Murray did most of his damage in the red zone, with 11 of his scores coming from within the 20-yard line and nine of them coming from within the five-yard line. However, Murray’s inability to move the chains became an Achilles heel for the Raiders, and they ultimately let him walk in free agency. The job is tailor-made for Lynch. There isn’t a hole-punching running back in the league better than Beast Mode (WHICH IS WHY YOU GIVE HIM THE BALL ON THE 1-YARD LINE, PETE CARROLL). If he gets anywhere near the same workload Murray got, he’ll make double-digit trips to the end zone in his sleep. Now a year removed from football, Lynch should be much fresher than he was the last time we saw him. He’ll also be running behind one of the top offensive lines in the league, and he’ll be used to grind away the clock to hold onto leads. The Raiders will ride him all the way into his second and final (?) retirement. Cutler had his best statistical season in 2014 when Adam Gase was the offensive coordinator for the Chicago Bears. Cutler completed 370 passes for 3,812 yards and 28 touchdowns that year, and he now reunites with Gase in Miami. If the offensive line can keep him upright (he only played five games last year) and he finds ways to keep the turnovers to a minimum, Cutler could produce similar numbers this year. Quessenberry returned to the field for the first time on August 10 after a three-year battle with non-Hodgkin T-lymphoblastic lymphoma. He’s already back to working with the first team and will need to return to form to help Houston reach the playoffs again this season. An offensive lineman has never won this award, but Quessenberry would be the perfect candidate to break tradition. Like the NBA, this award typically goes to the coach who surpasses his expectations the most. And like the NBA, there’s one man who’s a threat to win it every year. Gregg Popovich and Belichick each only have three Coach of the Year titles to their names, even though their respective teams consistently finish at or near the top of the standings year in and year out. This year, though, Belichick has outdone himself. Tom Brady is no longer suspended. Rob Gronkowski is back AND healthy. The offensive line is stable. The defense got the band back together. Did we mention Brandin Cooks? New England is the odds-on favorite to win the Super Bowl (again) this season, and a serious threat to go undefeated. While a lot of the team’s success should be credited to Brady, don’t forget who the real shot-caller is. At some point, greatness must be recognized. This is the first season in which Pittsburgh should have its full starting lineup ready to play in Week 1. Of course, that’s assuming Martavis Bryant is officially reinstated and Le’Veon Bell’s holdout ends before the regular season. The Steelers might have the best mixture of skill position players in the league. If they can all stay on the field, Pittsburgh has a serious chance of contending for a championship. Carson Wentz threw for 3,872 yards last year, and the Eagles have done nothing but upgrade the talent around him. They brought in LeGarrette Blount to beef up the ground game and Alshon Jeffery and Torrey Smith to bolster the receiving corps. They even focused on defense in the early rounds of the draft and traded for talented corner Ronald Darby. Philadelphia is primed to challenge for the NFC East division title. Talent around him? Check. “Bend don’t break” defense? Check. Stable coaching staff? Check. Plays quarterback? Check. Rodgers seems to check all the boxes for MVP every year, and it’s the reason he’s considered one of the best gunslingers of all time. Few guys can fire bullets or hit targets deep down the field quite like Rodgers. And even fewer can match his mobility in and out of the pocket. Green Bay looks to feature less question marks than it did this time a year ago. The offensive line seems to have recovered from the loss of Pro-Bowler Josh Sitton. Eddie Lacy’s conditioning is no longer a concern for the Packers, and Ty Montgomery figures to get twice the amount of touches he did last season. Jordy Nelson has shaken off the rust from his torn ACL in 2015. The defense is replenished with a lot of young talent. Rodgers’ numbers haven’t dipped at all since he last won MVP in 2014, however, the team’s win totals have. If the Packers make it back to their winning ways, it’ll no doubt strengthen Rodgers’ case for MVP. As mentioned before, Bell, for once, will start the year healthy and not suspended. Also mentioned before, he’s currently holding out for a new deal upwards of $15 million per year. To get that type of money, Bell will have to produce historic numbers for a running back. He’s got the ability to get there, but the real concern is his availability. He’ll either get rich or injure himself trying. It’s a bit ridiculous Miller hasn’t been given this award yet. He’s finished in the top-10 in sacks in each of the past three seasons, and he anchors the most threatening defensive line in the league. He’s gunning for 30 sacks this year, and it’s only a matter of time before he reminds everyone just how dominant he can be.